Not much is known of the dancing of the early Celts of Ireland but their artwork survives in the Celtic patterns on Irish dancing dresses. Their art consists mainly of complex, twining geometric designs, and the masterpiece of this art is the Book of Kells (mid 8th Century). The Anglo-Norman conquest of Ireland resulted in the banning of native Irish culture and dance. Traditional Irish culture was continued with some degree of secrecy right through to the 1600 -1700’s. 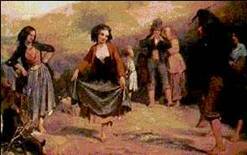 Around 1750’s with a less strict attitude, Irish Dance flourished under Dance Masters. A dance Master would travel the country side stopping for six weeks in a village and staying with the locals and teaching dance steps. Having an eminent dance teacher associated with your village was cause for pride and boasting by the community. Each dance master had a repertoire of dance steps and he created new ones over time. The choreography to eight bars of music is called a step. Irish Dance has a long tradition of being competitive. The early village competitions were won by the man who knew the most steps, not how well he did them! During the 1800s a popular event was a cake dance. A cake would be placed on a stand in the centre of a field as the prize for the best dancer. The winner would of course “take the cake”. Attempts by the parish priests to suppress dancing were frequent, but appear to be mostly ineffective. Modern Irish dance begins in 1893 when the Gaelic League was founded (Conradh na Gaeilge). This group encouraged the revival of Irish culture, long suppressed. In 1929 the Irish Dancing Commission was founded to establish rules and standardize teaching, judging, and competitions. It continues in that role. In the time of the dance masters and secrecy, dancers performed on kitchen tables or even barrel tops. By the 20th century, stages were being used for competitions so dance movements increased markedly. Steps that required substantial space like flying leaps were introduced. Now points are deducted if a dancer does not “use the stage”. Irish dance has evolved in other ways during the 20th Century. Instruction begins at a younger age. Before, girls danced in groups and the boys danced solo. Now mostly girls are taught Previously the arms were relaxed or placed on hips, instead of being held, as they are now, rigidly to the sides. It is said that the Parish Priests considered rigid arms a lot less provocative and stiff arms said to increase a girl’s self control. Dance costumes too have changed. in the 1800’s girls wore their “Sunday best” with ribbons. After 1893, the typical dance costume consisted of a hooded cloak or a shawl over a white dress with a sash. By the 1930’s the cloak was gone and the shawl evolved into the shawl now worn on the back caught with brooches. Until the 1980’s a cord with tassels was often worn around the waist. Males adopted the kilt in the 1920’s. Early colours were predominantly green, white and saffron, but never red, (although red was a traditional colour), as it was worn by the occupying English troops. In recent times all colours have come into use. Male colours are much more subdued. Embroidery was minimal on costumes in the early 1900’s. However it has steadily increased in use and complexity. Celtic designs over 1200 years old are used. Modern patterns on the same theme are used as well. Gold and silver are now in fashion in material and embroidery, which has not been used since pre Norman Ireland. Early dancers often danced barefoot. Soft shoes were introduced around 1924 for girls and boys, but boys have not used them since the 1970s. Hard shoes with fibreglass tips have changed the style and content of many dances. The “clicks” are now much louder than when coins or nails were stuck to the soles of shoes. Feis (Competition) rules state that competitors must wear traditional Gaelic dress, but it is unlikely that today’s dresses would have been recognized in Celtic Ireland. With the popularity of shows like Riverdance and Lord of the Dance, the boundaries of recognised “Celtic dress” is under even more pressure.